NASA’s Human Research Program (HRP) is releasing the video “Omics: Advancing Personalized Medicine from Space to Earth” to highlight its Twins Study, coinciding with National Twins Days. This is the last video in a series of eight that explores space through you by using omics to look more closely at the unique health of an individual. Breakthroughs in science and technology are providing researchers with additional data allowing for a more personalized approach to healthcare. The previous one-size-fits-all approach to medicine is slowly shifting to more personalized care for individuals, or precision medicine. Omics integrates multiple biological disciplines to focus on measurements of a diverse array of biomolecules. It combines genomics, transcriptomics, proteomics, epigenomics, metabolomics and microbiomics to see a larger, more comprehensive picture of the human body at a fundamental, highly granular level. 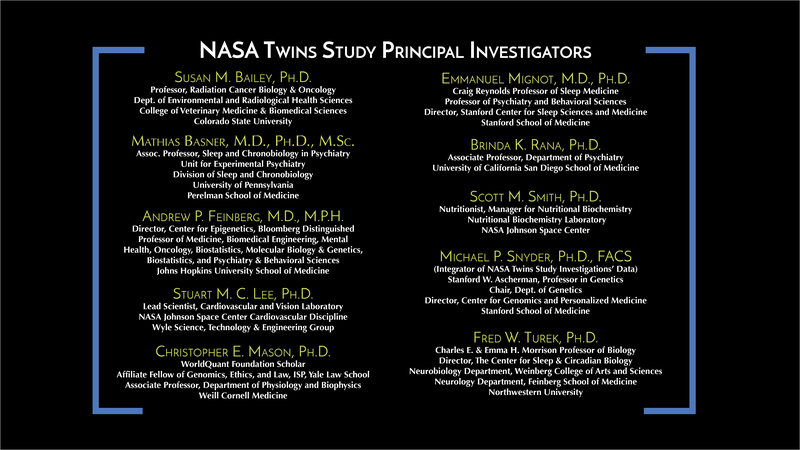 Twins Study Principal Investigators are using omics to compare molecular data of retired, identical twin astronauts Scott and Mark Kelly. It compares nearly identical genomes of one twin, Scott, on a defined diet, strict exercise regime, scripted daily work schedule and space stressors, and Mark, the other twin, on Earth engaged in normal life. The identical genome comparison allows researchers to focus on the other molecular effects of the integrated spaceflight environment. Researchers see more molecular reactions between biomolecules than ever before. This technological phenomenon is similar to the early 2000s, when NASA-funded survey observatories discovered about 1,000 asteroids that were classified as near-Earth objects (NEO). Today, discoveries of NEOs have increased to more than 14,000 asteroids due to improved sensors and detection equipment and other technologies and search strategies that have been developed. As medical technologies improve, researchers are discovering that fluctuations in DNA, RNA, proteins, metabolites and microbiome biomolecules influence physiological and behavioral changes in an individual, as well as the propensity to develop disease. Before omics profiles become commonplace in clinical settings, researchers will have to address the challenge of interpreting, storing and securing massive amounts of data. Perhaps, one day, omics profiles will be conducted not only on certain groups like astronauts, but on a large scale for individuals in doctors’ offices and hospitals. Many researchers are contributing to the fascinating field of omics, and NASA is adding twin astronauts into the equation. The Twins Study is NASA’s first step to establish a foundation and methodology to integrate space-related omics with traditional scientific activities, research plans and data to understand how to develop a more personalized approach to reducing health risks to astronauts. This may lead to personalized countermeasure packages to heighten the safety and performance of individual astronauts as they explore space. It’s hoped that one day omics research conducted around the globe, along with NASA’s research, could lead to longer, happier and healthier lives for all of us here on Earth. NASA's Human Research Program enables space exploration by reducing the risks to human health and performance through a focused program of basic, applied and operational research. This leads to the development and delivery of: human health, performance and habitability standards; countermeasures and risk-mitigation solutions; and advanced habitability and medical support technologies. NASA’s Human Research Program is releasing the video “Omics: Advancing Personalized Medicine from Space to Earth” to highlight its Twins Study, coinciding with National Twins Days.